I’ve completed rebuilds on ice boxes on a variety of Island Packets but until recently have not had a proper forum where I could go into sufficient detail on the process. I just undertook the rebuild on an IP-38 and will detail the process here for anyone interested in the method, materials, etc. 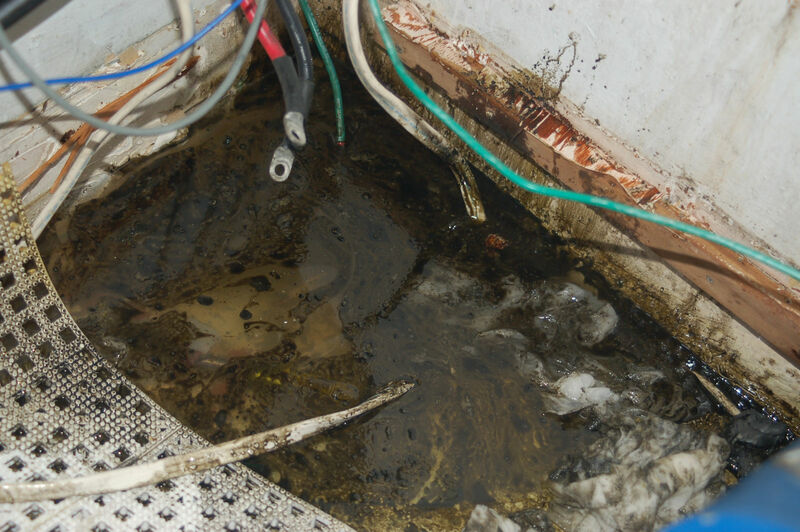 Note that this method involves lining the existing compartment with extra insulation – not the complete removal of the old tub and foam and a rebuild from scratch. 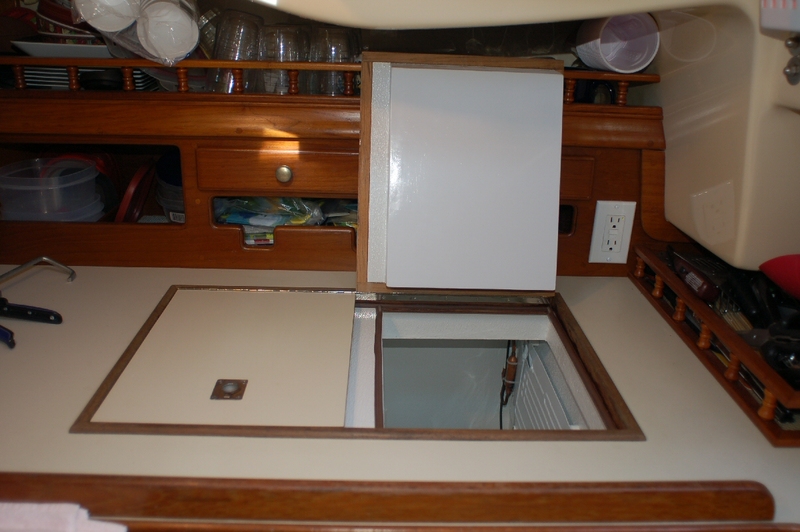 I was originally commissioned to remove old foam insulation and reline the freezer and reefer compartments on this boat. 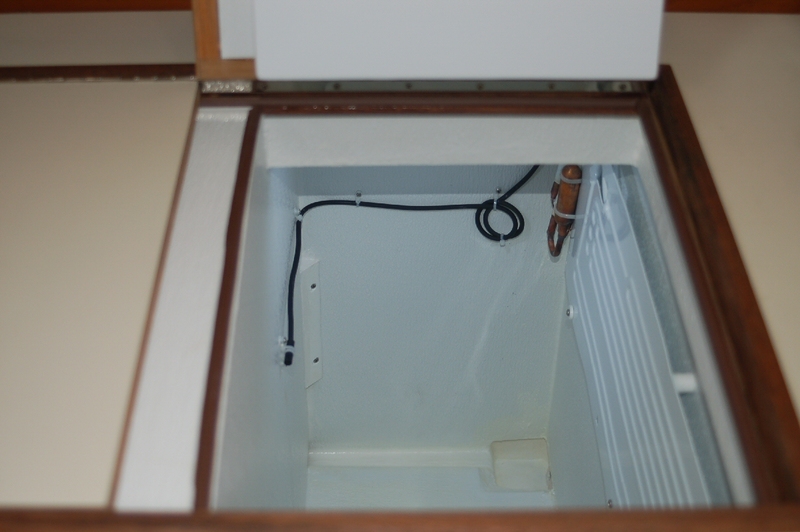 However, very early in the project the old Glacier Bay holding plate system suffered a catastrophic failure and the project expanded to include the removal of all of the old system, redo of the existing box and then installation of a dual compressor Frigoboat keel cooled system. 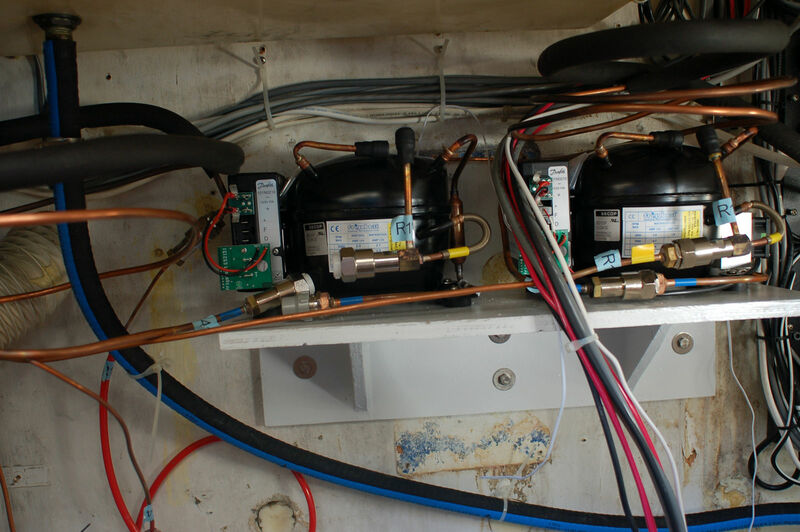 I spent several days removing the old system to include ruptured holding plates, completely corroded heat exchanger, and cleaning up the area where the old compressor and motor had been installed. After cleaning out the old system and cleaning up the mess left behind I started removing left over insulation in the box. I used a Multimax cutter to remove the old IP foam holder in the overhead area of the box and then used spray foam to fill every void I could find. Once the box was cleaned out and I had trimmed excess foam I started relining the box. 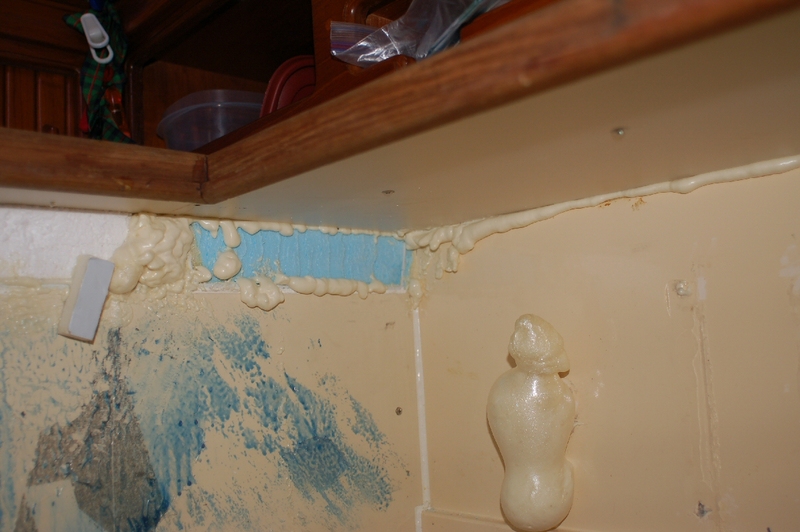 The starboard side of this box had already been foamed by a previous owner so my goal with this system was to provide a minimum of 1″ of new foam on all sides, 2″ on the top and make new doors to fit with 2″ of foam and rubber gaskets. In the IP-38 the box has molded in shelf brackets so I filled these areas with 1/2″ foam – metal side facing out. I cut the R-Max insulation to fit these areas, did a dry fit then when satisfied sprayed the inside of the box and the metal side of the foam with 3M adhesive. After letting the adhesive cure I press fit the pieces of foam. In the next step I created the top in two pieces so that they would fit into the opening. I laminated 2 pieces of 3/4″ foam with a piece of 1/2″ foam, used epoxy to glue a piece of FRP liner to 1/4″ plywood and then installed the lights into this plywood piece. I left a 1/8″ lip on the liner material around where the top opening is so that I could later use epoxy to complete the trim on the opening. 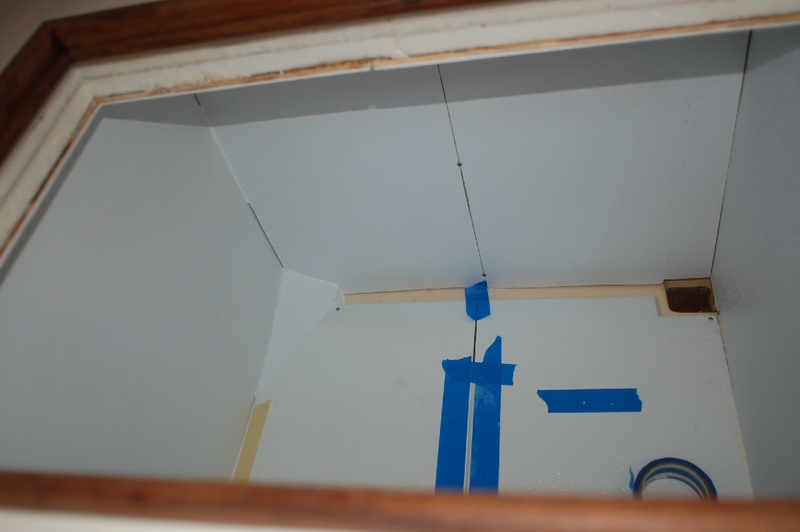 The front and back pieces of the box consisted of another layer of 1/2″ Rmax with FRP liner glued on. 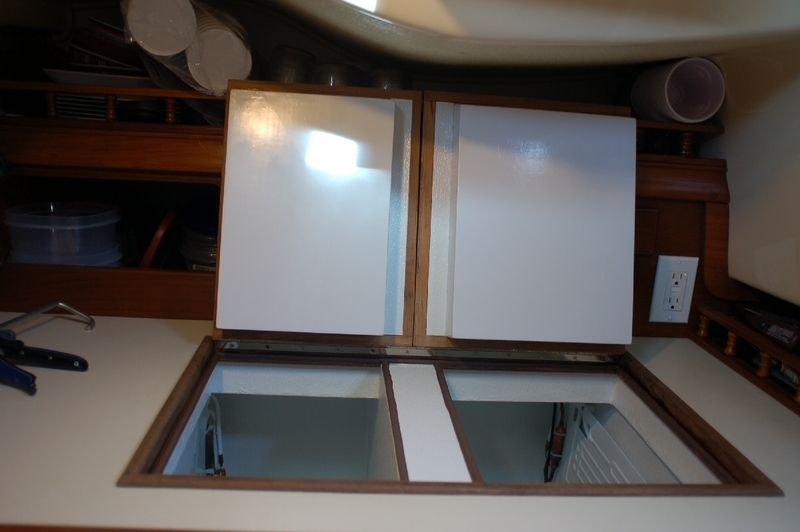 The sides were 1″ thick Rmax with FRP liner glued on. The installation sequence was done so that the various pieces would help hold things together – top first, sides next to help hold the top up, then the front and back pair pieces which help hold the top up and the sides out. For this project, since the drain is in the back corner of the box, I made the bottom with two pieces of sloped roofing insulation, also polyiso and lined them with FRP. Once the pieces were in position I mixed epoxy with slow hardener and white pigment and glued all but the top seams together. Just to hard to reach the inside top seams with epoxy so I used Fast Cure 4200 for the top. 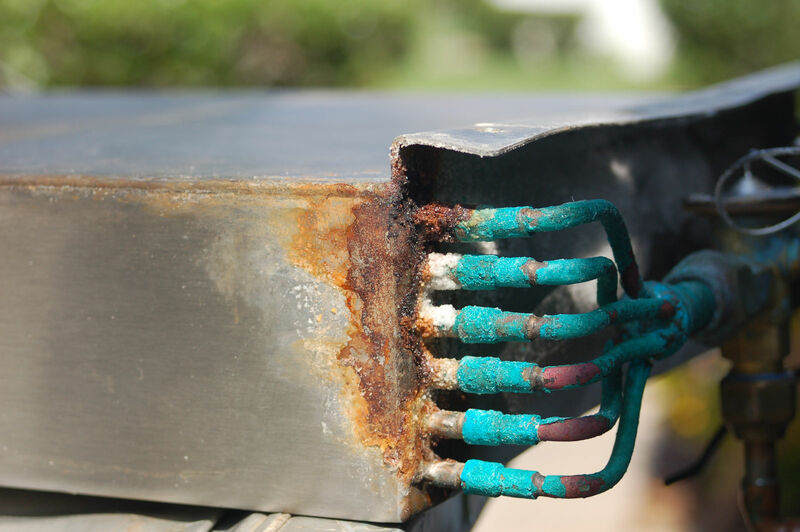 One of the more difficult parts of this project was to determine which flat plate evaporator(s) to use. 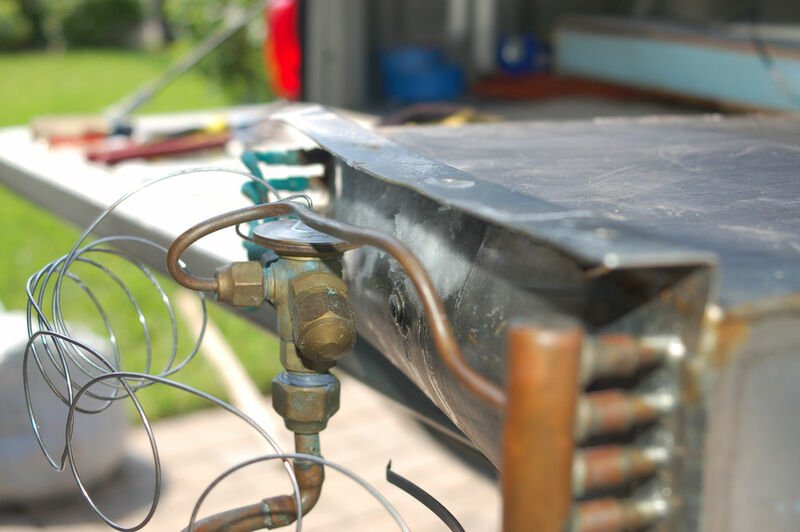 You want to go with the biggest plate that you can, keeping in mind that you have to bend it and then be able to feed the refrigerant tubing through the hole in the back of the box while getting the bent plate into the top opening. Once the evaporator(s) are in place I built the divider and installed it in two pieces. The first step was to template the divider using a piece of foam so that the shape was correct. Using the foam template, I cut two pieces of 1/2″ plywood and saturated the outside edges with epoxy resin then covered with epoxy and FRP liner. I then made a 2″ foam piece to this same shape to be used in the divider. 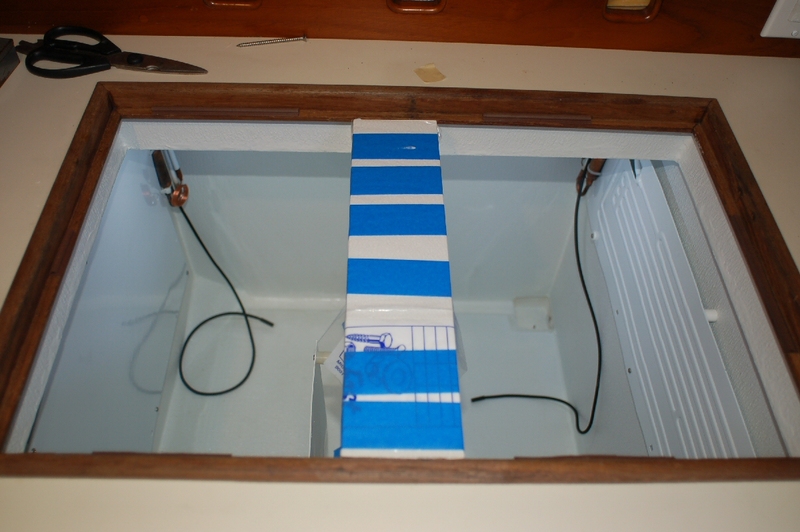 Installation of the divider was started with one single piece of the plywood divider set into the box, aligned fore and aft and secured to the front back and bottom of the box with 3/4″ aluminum angle. 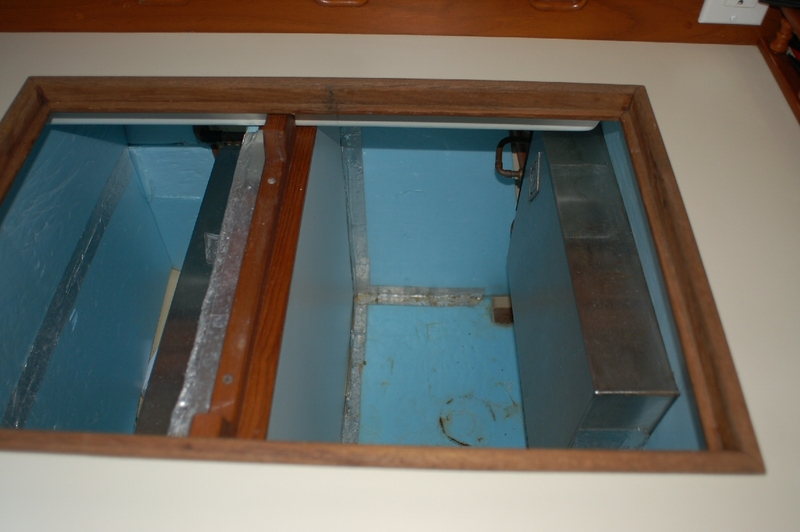 Once the first piece of the divider was in place I sealed the inside edge with FC 4200 and epoxied the outside edges. 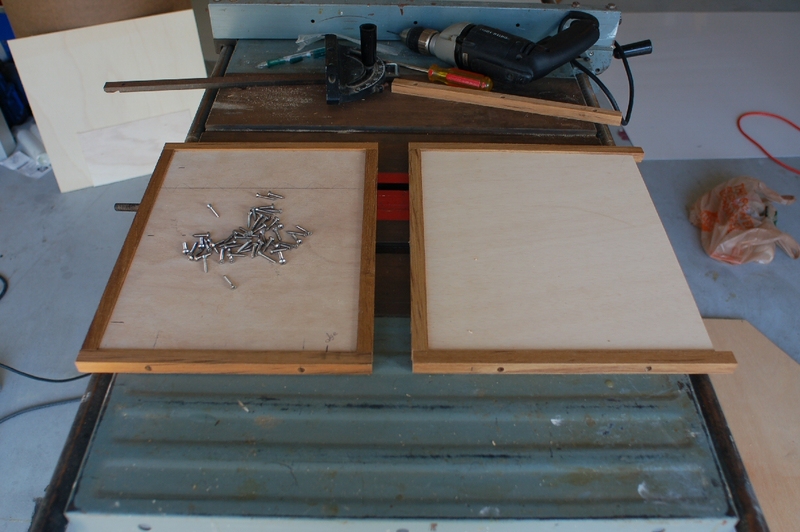 After the first part of the divider was in the box the other pieces would no longer fit so they had to be cut vertically and installed in pieces. I cut the foam portion of the divider just behind the back edge of the top opening and then cut the right side divider about 3″ back from that. The 2″ foam pieces were glued to the inside of the left side divider and then the two pieces of the right side divider were installed. 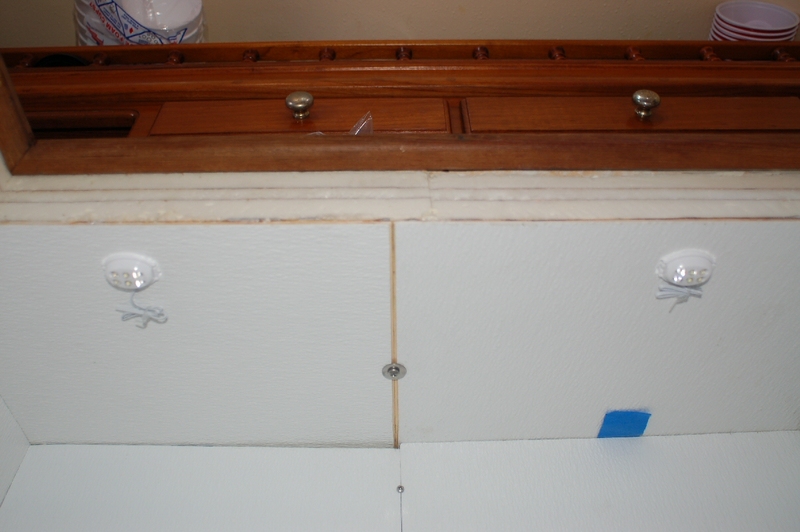 I used reversible bar clamps to hold the right side divider in place and then epoxied the bottom, sides and middle seams. 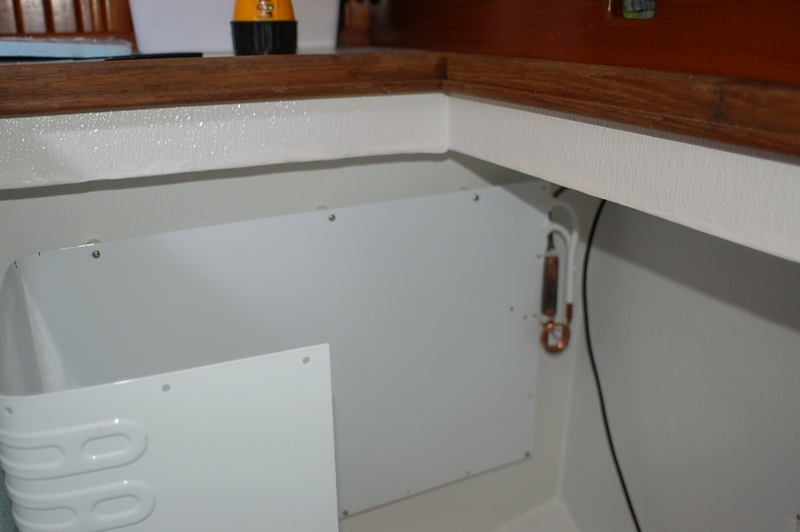 After the epoxy cured I used some corner shims cut from starboard to help hold the divider in place. Once the box was finished I fabricated new doors. The doors are fabricated from teak strips planed to approx .65″ which are glued and screwed to 1/2″ plywood and shaped insulation boxes fabricated from 1/4″ plywood using the stitch and glue method. 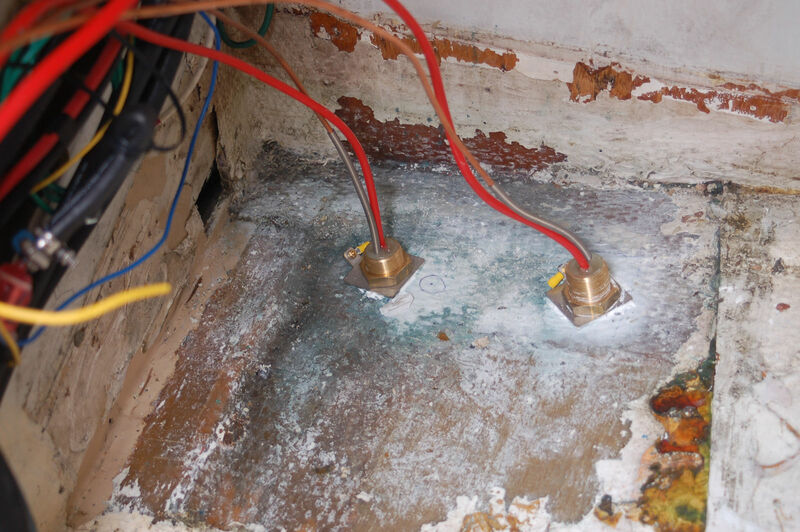 The insulation boxes are cut and then tied in place using small copper wire. All joints are filled with thickened epoxy and the wood is saturated with several coats of tinted epoxy. 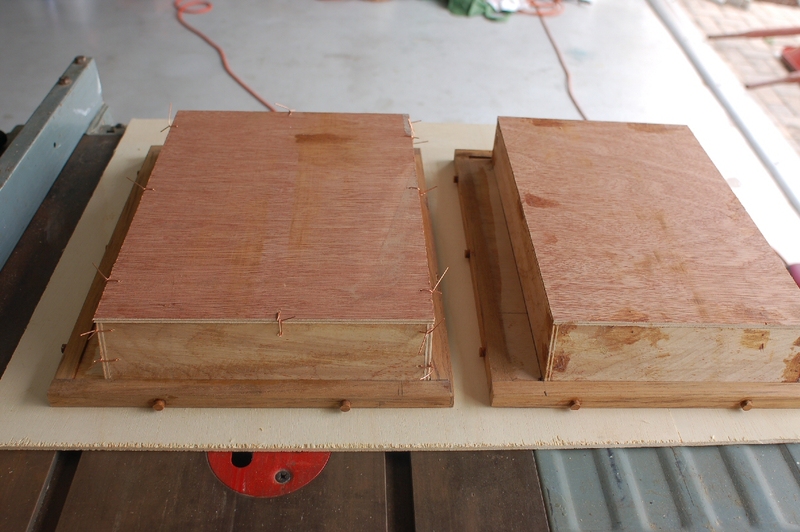 The top portions are covered with almond Formica, lift ring holes are routed and then the insulation boxes are epoxied to the tops. I attached thin rubber gaskets to the inside area of the top door opening, then dry fit the doors to determine the length of a 1 1/16″ piano hinge and placement on the doors. I cut the piano hinge at the seam between the doors so that the doors can open independently but so that the portion of the hinge that attaches to the top is one continuous piece. The doors are placed so that they rest evenly on the new gaskets and then the piano hinge is mounted to the back of the box opening. 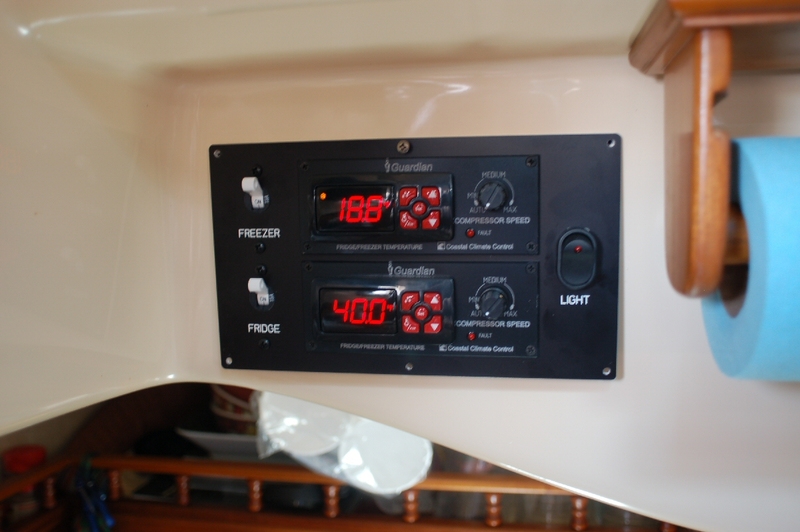 Installation and connection of the Frigoboat components is straightforward.